Residents of the small towns of Port Douglas, Mossman and Daintree in Tropical North Queensland are lining up for a fight. It’s a fight for their futures, and that of their children and grandchildren, well into the foreseeable future. For five years now, the old Douglas Shire, which encompassed the area north of Ellis Beach to Cooktown, has been under the rule of the Cairns Regional Council, with which it was forcibly amalgamated by the then State Government, despite wide protests from residents. Huge assets and cash of around $24 million were transferred to Cairns Regional Council and one lone councillor became responsible for the whole of the previous Douglas Shire (as well as additional Cairns suburbs), which had previously fielded seven representatives. The reality of being governed by a group of councillors and staff, whose interests are elsewhere, has been depressing and frustrating for many residents of the, former, proudly independent, shire. My personal experience in dealing with Cairns Regional Council, as Coordinator of the highly successful Go Troppo Arts Festival in Port Douglas, seemed like a constant battle and reinforced the general impression that there was little interest or understanding, from staff and the majority of councillors, of either the Arts or of our unique geographical and social situation. The Douglas region has immense natural resources, a 'plus' for its previously thriving Tourism industry, for which Cairns is now a direct competitor. The previous Douglas Shire had a brilliant record of innovative, sustainable planning and financially and ecologically sound management. Residents, who are on the electoral roll, will have the opportunity to vote to become independent and regain their sense of identity in a referendum to be held on March 9 – or to reject the opportunity forever. There’s no going back once a path has been chosen! Understandably, many people have aligned themselves in one camp or the other and emotions and wild ‘doom and gloom’ pronouncements abound. What are your thoughts about de-amalgamation? If you own property in the Douglas region you will, no doubt, be interested in the situation, as you have already suffered huge rates rises and perhaps are not happy about the sometimes unkempt state of the main streets or the interference with our, once pure, water supply, the dismissal of the Waterfront Plan – or even the wilful destruction of the coconuts on Four Mile Beach. Unless you are also on the electoral roll you will not be able to vote but you can, at least, express your opinion. Are you FOR or AGAINST de-amalgamation of the Douglas and Cairns Shires? Please tell us WHY? Friends of Douglas have expressed outrage at the Local Government Boundaries Commission advertisements being booked with the media that take a partisan view in the upcoming referendum. FODS spokesperson, Robert Hanan, said the ads amounted to scare campaign against de-amalgamation. “There is a clear need for the Electoral Commission to run ads about the mechanics of the referendum, however the Boundaries Commissioner should not advertise a political message, funded by the taxpayer,” Mr Hanan said. “We are appalled the Boundary Commissioner, Col Meng, is running this type of ad. The Commissioner should be impartial and should be ensuring both sides of the debate are heard, he should not politicise the role of the Commission. All we hear about are overblown costs. Mr Hanan said FODS was made aware some time ago the Commissioner wanted to run a No Campaign but understood this was squashed by the Minister. Deborah, I am sure that you are right about increased costs in all aspects of living - including local government costs - staff, travel, maintenance of utilities and so on. It is difficult for us to make decisions about matters beyond our direct experience and knowledge so, yes, some of us are guided by our emotions and desire for self determination as well as trust in well researched facts. But then, there are things that we know with certainty, such as the enormous wastage incurred by a distant authority, one that regards us as a 'cash cow' at best, but mostly as a bit of a nuisance - a thorn in its side. I see de-amalgamation as a once-in-a-lifetime opportunity to start again and build the best conditions possible for ourselves, our children and grandchildren, controlled by us all. Stars in my eyes? Maybe, but vision and integrity are the stuff of which success is made. Fear is a great motivator for inaction. But, given the will, we can build an exciting future - together! Are you coming to the meeting in Port Douglas on Thursday? It's an opportunity to ask specific questions, which I am sure speakers would welcome. I was disappointed by the FODS meeting last night in Mossman. There was a lot of emotion about the old Shire, the "glory days", the "boom days" of Mossman, which seemed to appeal to most of those in attendance. Funny, I don't remember such days, but I looked around me at the state of reverie of the people, most of whom I didn't recognise, Port Douglas residents. I wanted facts, not emotion. I didn't come to hear Ms Leu stirring emotion. I didn't want to hear yet more confusing details of a very subjective model. Nor did I wish to hear about the glory days that are a figment of our ex mayor's imagination. The buckets of money that he talked about are gone. The state and the country's coffers have been drained by our Labor governments' wasteful policies. The stark reality is that there are no buckets of money. We will be footing the bill for de-amalgamation and our children could be left with a legacy of debt. One FODS member stated that we could extend the debt over 10-15 years. This means more pain for the future, for our children. We need the facts, not the emotion, not the obfuscation. I didn't get a chance to have much say or to express my concerns as I was shut down after about 2 minutes. All of the modellings are based on estimates which are based on assumptions. No one model is correct. One thing is for certain. We will be paying more not paying less in our rates across the board, or we will have to sell off some assets. There are no buckets of money any more. We have to get used to this fact and take responsibility for our own choices (and past ones). Make 9 March YOUR Independence Day. I hope lots of young people can become aware of the de-amalgamation issue and the background to it. They are the ones who this referendum will affect most acutely. If de-amalgamation does not happen, this Shire may not have any representation at all in the future when the CRC does away with divisions. Douglas will become another tired suburb of Cairns. This is the ONLY CHANCE Douglas will ever have to regain self-determination. I'm sure young people understand and value this ability. The mythical costs flying thick and fast from the naysayers and dog whistlers are just that. Fear has overcome fact. The main thing is to ENROL TO VOTE BY 8 FEBRUARY. I encourage all the young people of Douglas to exercise their democratic right to ensure the Shire stays in their hands. Amalgamation was an undemocratic dog of an idea in the first place. It promised much but didn't deliver. Its legacy in Douglas is there for all to see - from its massive rate hikes which subsidise Cairns' interests; a pristine water supply contaminated with chlorine, mutilated treescapes, and worst of all, a complete disregard for the opinions of the people who live in this unique community. A New Douglas Shire has a real and exciting future. Please seize this chance to ensure it. All the costs that QTC have identified are already factored into the FODS budget model, including extra staff and capital works of $42 million over 5 years. The QTC report suggests that a large proportion of the costs be borne in the first year of a new Council whereas the FODS model has allowed a longer period to absorb the costs of de-amalgamation, which would only be fair to the community...why should one year of ratepayers pay for something that will be a benefit to the community for generations to come. 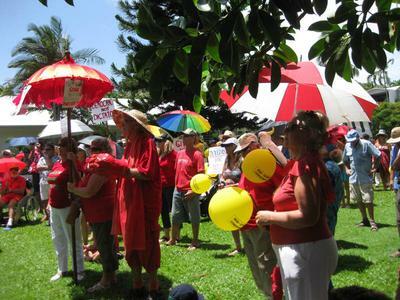 Even the Minister for Local Government himself, has stated that QTC’s figures do not automatically mean a massive rate increase “because any council can cut its cloth to suit” – The Honourable David Crisafulli, Rockhampton Morning Bulletin (24.01.13). The FODS budget model is currently being assessed by an Independent economic consultant and we should have his report next week. FODS will be hosting a public meeting in Mossman on the 7th February at the Old Shire Hall - 6 pm. The meeting will be advertised. Please come along. While the Friends of Douglas Shire (FODS) have put up objections to the QTC Report suggesting that it is incorrect and a de-amalgamated Douglas Shire would in fact be financially viable to date none of FODS' arguments have stood up. Visit the Douglasratepayers Facebook page to view the explanations. So the elephant in the room is that if the Douglas Shire were to be de-amalgamated it would cost each and every ratepayer a minimum of $700 per property immediately plus a further $400 per year for the first five years just to cover the costs associated with de-amalgamating. On top of that the new council would have to raise rates by 24% in the first year and a further 20% each year after that just to break even. There would be no money for a lagoon pool, no money for a waterfront and no money to sewer Cooya or Wonga or any of the northern beaches. There are a whole host of other problems but if a de-amalgamated council is financially unviable then the rest probably doesn't matter. Click here to return to Art Discussions.